To climb or to scramble, that is the question. Many people are keen to explore the hills, mountains and ridges of the UK. For safety reasons, it is important for individuals to traverse such rough terrain at a level that suits their fitness level and tastes. Luckily, there are all sorts of ways to climb in the countryside. Whilst indoor, manmade climbing walls can be found in most cities, for many, the allure of conquering nature and battling the elements draws them out to the hills, mountains and rock faces of the UK countryside. Rock climbs will follow a pre-planned route and a defined endpoint will be aimed for. The climber's hands are used to hold their weight, as is sometimes the case in scrambling. Rock climbing is a demanding, extreme rural sport. The climber’s endurance, strength, agility, concentration, balance and mental power are all put to the test which can be a lot for one individual to take on. For safety reasons, climbers commonly work in pairs, using a combination of ropes and anchors in order to minimise the risk of falls. Climbing can occasionally be damaging to the environment. Soil erosion, plant damage and a build up of climbing chalk have all been pinpointed as problematic. Climbers should ensure that ropes and anchors are not discarded and should avoid areas known to be populated by rare species of birds, plants or other animals. Climbing requires high levels of mental concentration and physical exertion, which can prove rewarding but may not be for everyone. Those who are looking for something a touch more challenging than hill walking but not quite as demanding as rock climbing may meet their perfect matching with hill scrambling. Indeed, many easier climbs are often termed scrambles. Scrambling is, in many ways, akin to climbing. 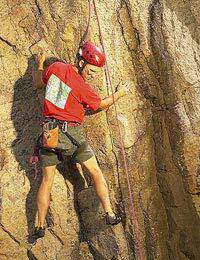 It involves traversing a hilled, usually rocky terrain but, crucially, ropes and other climbing equipment are not usually used. Instead, the scrambler’s hands become their primary article of equipment. The hands are sometimes used to hold the scrambler’s body weight, rather than just to support their balance, as is the case in hill walking. Despite the stress on hands over ropes, it is advised that scramblers always carry a rope for safety reasons. This can be used to assist less confident scramblers and to negotiate difficult terrain. Scrambling is popular in the UK, with ridge routes being favoured. Many of these routes include what it termed a ‘bad step’, where the terrain suddenly becomes far more challenging. Therefore, it is important to research a scrambling route in advance. It is also highly advisable to consult weather reports before beginning a scramble. Poor weather conditions can transform an easy scramble into a difficult climb. Protective clothing such as a waterproof should be worn. Scramblers should also carry a detailed map, a first aid kit and emergency supplies. The challenge of the climb can be an alluring prospect for sports fans and rural enthusiasts alike but it should be understood as a high level physical activity. For those looking to take a slightly slower pace whilst enjoying the verdant countryside and the scenic views it has to offer, scrambling may well be the answer.